The Reaper is the shadowy figure of an executioner with burning red eyes. He uses an iron battleaxe to attack in addition to a spitting attack similar to that of the Afflicted. In order to fight the Reaper, you must acquire a complete set of three Reaper gem fragments, which are scattered in chests of the Soul Cairn; each specific fragment spawns in two different locations but only one set of the three different fragments is needed. You then place them at the altar in the Reaper's Lair. Doing so will summon the Reaper along with a few bonemen. He wears a unique set of unlootable robes, hood, and bracers. When defeated, he drops three black soul gems and a Daedra heart. The Reaper "quest" isn't actually a quest at all but just a unique encounter that requires special steps to trigger. If you are having trouble finding the gem fragments, they are always in a chest directly underneath one of the Ideal Masters (giant floating health-draining gems). The Reaper carries a Daedra heart, thus implying it may be of Daedric origin. You can get around having to collect the Reaper gem fragments by scattering a few Fire Runes on the ground near him. This will summon his minions from below and draw him out for the fight. Just move to the back of the room and cast a mine on the large pile of bones. This same effect can be achieved using a Flames spell. Jumping up the bone pile until you almost touch the sparkling part of it will also summon the reaper. Watch out though, he'll be close. 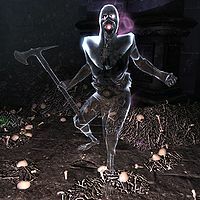 It is not possible to loot the remains ("Soul Embers") of the Bonemen in the lair, even though the option to do so is presented when they die. This page was last modified on 9 July 2018, at 03:48.